New book on adult stem cell progress gains major support as world stem cell leader Ian Wilmut stuns the scientific world in turning from embryonic research to adult stem cells. Miracle Stem Cell Heart Repair documents how hearts of "no option" patients in the FDA trial are repaired in a one time procedure using their own stem cells. Herein lies hope for 22M dying WW of CHF, 5M in the US. If you take the moral, political and ethical concerns off the table, the scientific issues alone confronting ESC research (according to many scientists) are in themselves, daunting. Before an ESC can be safely injected into a human being it must be proven safe in an animal study. In cases to date, animal subjects have experienced dangerous tumor growth and rejection by the body. Politicians will ask us to allocate billions for stem cell research without having a clue as to what is possible, probable or even feasible. As example, we were told treatments for heart disease; spinal injury, Parkinson's, blindness, MS and diabetes could only come from embryonic stem cells. The truth is, not one treatment for these diseases has come from an embryonic stem cell. Instead, successful treatments for each of the ailmnents are coming from (non-embryonic) adult stem cells. Why has the public not been made aware of these important breakthroughs? Isn't it time we receive accurate, factual information as we are asked to help guide what might arguably be the most important medical advancement in medical history? Finally, last week, revered embryonic scientific stem cell leader Ian Wilmut (cloner of Dolly the sheep) made an announcement in support of adult stem cells over embryonic that stunned the entire stem cell research community. The professor did not base his conclusions on religious or moral preference but on solid scientific principal. As a matter of fact, Professor Wilmut has never believed embryonic research to be unethical, he simply concluded, there is a better way to accomplish the objective without destroying the embryo. Earlier this year, neurologist Dr. Carlos Lima, addressing the House of Lords in England reminded all in attendance that even though government funding for embryonic research had been limited in both England and the US, research has been going on unfettered for more than 10 years in the rest of the world including China, Russia, Korea, India and Germany. Embryonic research has not produced a single successful documented treatment. 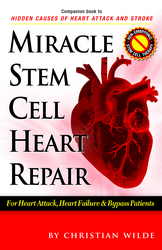 Perhaps nowhere has the case for adult cells been previously made more succinctly than in author/researcher Christian Wilde's new breakthrough book, Miracle Stem Cell Heart Repair. As the author explains; "If you take the moral, political and ethical concerns off the table, the scientific issues alone confronting ESC research (according to many scientists) are in themselves, daunting. Before an ESC can be safely injected into a human being it must be proven safe in an animal study. In cases to date, animal subjects have experienced dangerous tumor growth and rejection by the body." He believes the public deserves balanced non-selective and un-biased reporting on both forms of stem cell research. Currently Heart Failure is claiming the lives of 22 million victims world wide with a one to seven year life expectancy and 50% not making the five-year mark. There is good news a-coming, Miracle Stem Cell Heart Repair documents "no option" heart patient's stories who have successfully transitioned within the FDA trials from near death to recovery following a one time, minimally invasive procedure using their own thigh muscle stem cells. Why, asks Wilde, should it be headline world news that someday an embryonic stem cell might possibly heal a mouse heart but nowhere is there a headline that proclaims hundreds of actual living breathing people, (not mice) have already had their damaged hearts repaired with adult stem cells? Is this a case of selective reporting? Several of the patients in the study treated at Columbia and Arizona Heart Institute,whose stories are recorded in the book had survived as many as five previous heart attacks. As one patient's own physician told him, frankly I don't know how you are even alive, 75% of your heart is not functioning. Following the one-time autologous treatment with the patient's own stem cells at Arizona Heart, performed by Nabil Dib, M.D., Chief of Cardiovascular Research (currently Director of Cardiovascular Stem Cell Therapy at UCSD) the patient was walking one mile and then two miles a day in a literal matter of weeks. A simultaneous study done at Columbia, Minneapolis Heart, Cleveland Clinic, Mayo Clinic and St. Joseph's has confirmed similar favorable results and the MARVEL (follow-up) study has now been approved to enroll up to 390 more patients as treatment in the two studies moves closer to approval. The first patient to receive his own stem cells in the US almost four years ago continues to do well. This first procedure was performed by M.D., Warren Sherman, Director of Cell-Based Endovascular Therapies at Columbia and Chief Investigational Officer of the expanded FDA study. Adult cells are being used currently to treat Parkinson's, blindness, traumatic brain injury, MS, several cancers, type I&II diabetes and more than 72 diseases. Four hundred fifty blind patients in India and eight patients per month in Cincinnati are being cured of corneal blindness. A type I diabetic patient in London has been insulin free for three years following a one-time injection of bone marrow stem cells to the pancreas and type II diabetes are similarly successfully being treated in Argentina and Brazil using adult stem cells. Spinal injury: One hundred five quadriplegic and paraplegic patients are beginning to walk (some with braces) following a single procedure in which stem cells from their own nasal olfactory cavity were harvested and injected into the areas of spinal lesion. One-half of Dr. Lima's patients are from the US. Miracle Stem Cell Heart Repair contributors are eight of the world's leading stem cell scientists serving as directors of cardiovascular cell therapy from the universities of Columbia, UCSD, Pittsburgh, Minnesota, Tufts, Johns Hopkins, Cedars Sinai Medical Center, Arizona Heart and Minnesota Heart Institutes and directing the ongoing FDA trials.